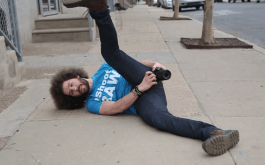 Why did Casey Neistat switch to the Canon 6D Mark II for vlogging? The simple answers are: better auto focus with dual pixel AF and better depth of field. He was using the Panisonic GH5 which so many people swear by. Sure that camera offers a lot of different bit rates and video features but you lose me at the super small sensor. I’ve been using the 6D Mark II since it came out for Vlogging and used it in this video as well.